The Chiocciola chair designed by Studio 65 for Gufram, is in the form of a stylized acanthus leaf. It is made of polyurethane foam and upholstered in red stretch fabric with yellow seam. While the Chiocciola chair is modern in origin and material, like many of the objects by Studio 65 its inspiration draws from history. Leaf borders and scroll motifs were used extensively in the art and architecture of ancient Greece and Rome and foremost of these was the acanthus motif. The acanthus is a common plant found in the Mediterranean region and its leaves are are often said to represent long life. 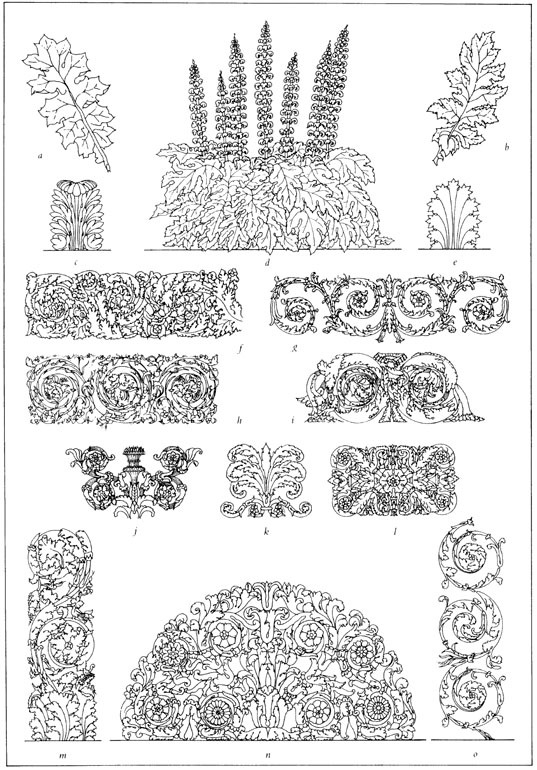 Acanthus motifs from Robert Adam's Classical Architecture. Image source. Christies sold an example of this chair in their Modern Design Sale 8713 of March 29, 2000 in London, South Kensington. The chair realized £1,495 ($2,376) against an estimate of £1,500 – £2,000 ($2,384 – $3,178). The interior of “Skin Up”, a shop celling gifts and leather articles, designed in Turin in 1972. From Studio65 by Franco Audrito, p. 22. Chiocciola armchair (1972) made of expanded polyurethane. From Studio65 by Franco Audrito, p. 54. A Chiocciola chair was listed on eBay and shown in considerable detail. Some of the images are shown in the gallery above. Offered by Vintage Views for $2,200. Chiggio, E. (1986). Studio65, Electa, p.91. Audrito, F. (2001). Studio65. l’Arca Edizioni, Italy, p. 22, 54.